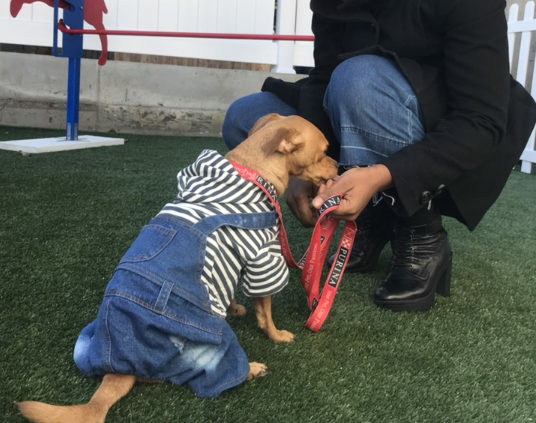 Meadow Brooks and her 3-year-old chihuahua-terrier mix at the dog park at a new shelter for domestic violence survivors in Brooklyn. BROOKLYN – When Meadow Brooks* left her abusive partner in Houston, she found refuge for all but one of her family members — Honey*, a 14-pound Chihuahua-terrier mix. With few pet-friendly shelters, the mother of two grappled with boarding her furry friend (* names changed to protect identity). “Leaving Honey was one of the hardest things for me, not knowing if or when we would be able to unite,” she said. Brooks’ story isn’t uncommon. Only three percent of shelters accommodate pets. Now, Brooklyn is home to the nation’s first 100% pet-friendly shelter for domestic violence victims. While some shelters allow animals, the number is usually capped at a small percentage of available units. The new, 7-story building, dubbed PALS Place, has 30 one- and two bedroom apartments and can accommodate at least 100 residents and their animal friends. The residence will open in December. It was developed by the Urban Resource Institute (URI), an organization that provides shelter for victims of domestic abuse. In 2013, the non-profit launched People and Animals Living Safely (PALS), a program to retrofit its existing shelters to accommodate pets, and a shelter that is 100% pet-friendly was the natural next step. PALS helped reunite Brooks and Honey by helping to find a temporary apartment after she arrived in New York. 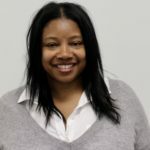 “The fact that there was someplace that we could all come together, even though it wasn’t permanent and we weren’t settled, we could be together,” Brooks said she was grateful. According to research, 48 percent of victims stay in abusive relationships rather than leave their pets. More than 70 percent of victims say their pets were threatened, harmed or killed, according to research on animal welfare and domestic violence. “By providing survivors of abuse with co-living options that keep people and pets together, PALS Place marks a significant milestone in URI’s ongoing commitment to addressing service gaps through innovative programming and approaches to ending cycles of abuse,” said URI CEO Nathaniel Fields. The building boasts an outdoor rooftop, community rooms and a recreational area with computers for residents. Pet owners can care for their loved ones in the building’s grooming station and enjoy pet-friendly outdoor space. URI’s Chief Program Officer Dr. Carla Smith said the organization worked closely with the ASPCA and Purina to design a pet-friendly environment. Partners provided pet food and designed animal stations specific to the needs of residents and their pets. 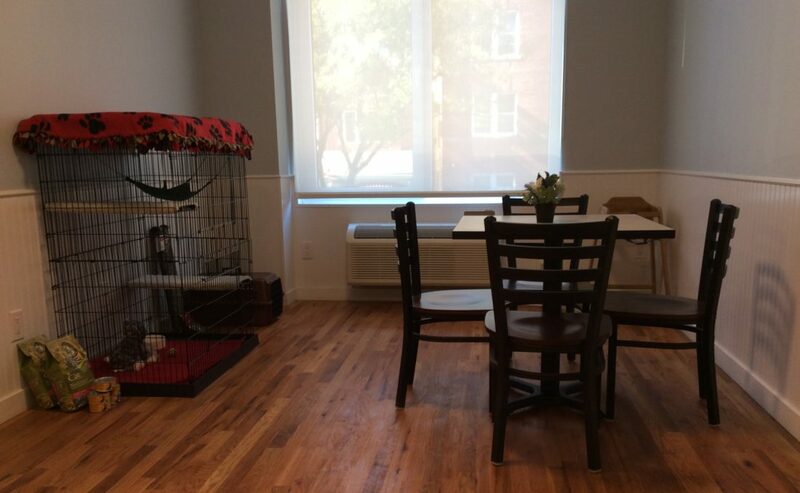 Pet-friendly accommodations at a domestic violence shelter equipped to house victims and their pets. Planners used soothing paint colors to calm animals instead of harsh whites. Wainscoting lines the walls in most of the common areas to maintain a space free of stains and scratches. Treated wood floors help curb damage from pet accidents. The full-service shelter’s staff of 30 will include case managers to help with trauma-stricken residents and their pets. For Brooks, who resided at a different PALS shelter, those services came at a good time as Honey showed bouts of aggression, likely suffering from PTSD. “We needed a lifeline at that moment, and Urban Resources Institute and the PALS project was it,” she said.